I just ate a box of Cracker Jack popcorn and peanuts. It tastes just like it tasted when I was a kid. Even the box looks t he same with the little sailor guy and his happy dog. But something has gone terribly wrong. The “surprise inside,” the big prize, is crap. No ring, no whistle, no game and not even one of those tattoos I never liked. Instead I got a little piece of paper with a diagram telling me how to fold it to make it fun. Nope. Not fun. I wonder if 20-somethings see church like I see this box? There’s talk of faith, mystery, miracles and community but when they open the box the big surprise it’s just more talking. They open the box to find the surprise inside is just more talk about how great the surprise is. No wonder they’d rather get a tattoo. The surprise inside? Authentic, transparent, Jesus-loving, risk-taking leadership. I wonder what would happen if we started stepping out in faith, reaching into new communities and refused to be stifled by bean counters? What if we took risks for Jesus? 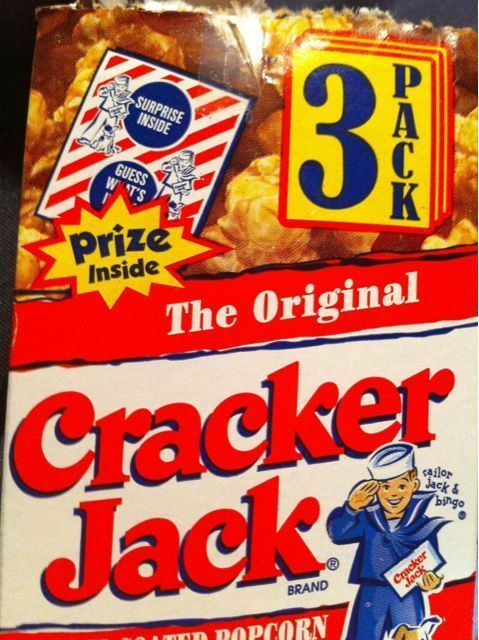 I bet you we’d see 20’s and 30’s excitedly inviting others to open the box and discover the world-changing prize inside. I bet people would discover Jesus. This entry was posted in campus ministry, Christianity, church planting, direction, Find God, gospel, Jesus, leadership, ministry, pastor, religion. Bookmark the permalink.